Weekend Kits Blog: Beginner Craft Kits Make Learning Easy & Fun! The start of a new year is an ideal time to think about learning a new craft. In these tough economic times, many of us are deciding to stay home more often, but it can be a challenge to find productive ways to spend our Weekends at Home. I think you'll find that spending an afternoon learning to create something new is a fun and rewarding way to spend your leisure time at home. Crafting is a great way to bring family and friends together for a weekend afternoon. Many crafts are relatively inexpensive when compared to bringing the family to an amusement park for the day or even the movies for the afternoon. At Weekend Kits, our goal is to make learning a new craft easy & fun! Our mission is to offer Creative Project Kits for Your Weekends at Home across a variety of craft categories. You'll find a range of kits appropriate for beginners. Our beginner craft kits include the patterns, materials, and instructions you need to complete your project with confidence. Many kits are complete, with everything you need contained within the kit. Other kits may require you to have a specific tool or supply on hand. Details for each kit are noted within the product description. Here are just a couple of ideas to get you thinking about your next craft project. 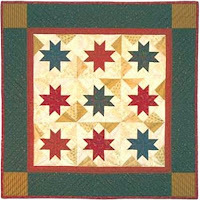 The Scrap Stars Wall Quilt is a complete beginner quilt kit from Rachel's of Greenfield. I highly recommend Rachel's quilt kits for beginners. They include all of the materials you need to complete the wall quilt project, including 100% cotton fabrics for the quilt top, backing, and binding. These kits even include batting! You also receive complete patterns, illustrated instructions, and quilting designs to finish your quilt. When completed, you'll have a beautiful wall quilt to display in your home or to give as a thoughtful handmade gift. There's something very memorable about the process of making a quilt, especially your first quilt. You'll remember every stitch fondly and even those frustrating moments with the seam ripper (yes, we all have them) won't seem so bad looking back. Learning to quilt should be a fun experience and complete beginner kits take the guesswork out of choosing patterns and materials. Visit the Quilt Kits section of the store for details on this kit and other beginner quilt kits. If you've ever wanted to learn how to hand embroider, but didn't know where to start, here's the perfect beginner craft kit for you. 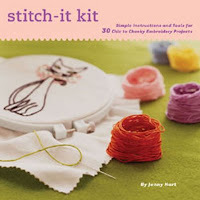 The Stitch-It Kit by Jenny Hart brings together everything you need to get started! This beginner embroidery kit includes an embroidery hoop, embroidery needle, 7 colors of floss, 2 tea towels, 35 transfer patterns, and a full-color illustrated instruction book. The embroidery patterns in this kit are modern and fun. With easy how-to instructions, you'll be embroidering in no time! The only thing you'll need to have on hand is a pair of scissors, and most households have a few of these laying around, although they never seem to be there when you need them! One of the nice things about hand embroidery projects is that they're so portable. You only need a small tote bag and you're ready to stitch wherever you go! They're also a nice way to stay busy while watching your favorite movie or television show. Visit the Embroidery Kits section of the store to see our complete selection of beginner embroidery kits. Make sure to visit the Kid's Craft Kits section too. We have a great selection of kits for kid's to learn a new craft. Kid's enjoy spending time being creative and it's even more fun when you have projects to work on together! Visit Weekend Kits to explore all of our creative craft categories and be ready to learn a new craft on your next Weekend at Home! We'll be adding many new kits in 2009, so be sure to check back often.